If you’ve been diagnosed with chronic obstructive pulmonary disease (COPD) you understandably have a lot of concerns. 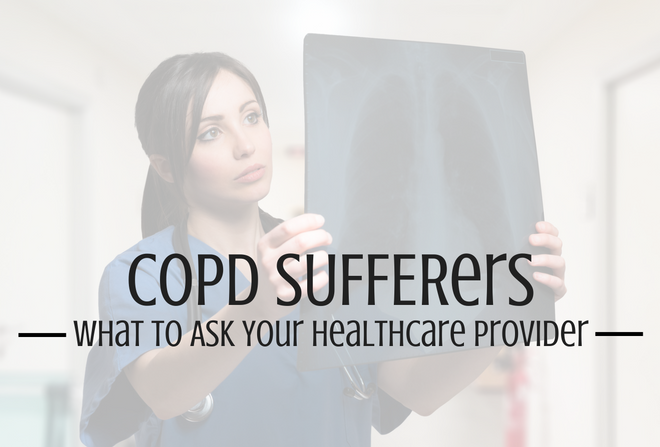 Aside from the breathing difficulties you’re experiencing, you have a lot of questions for your healthcare provider, including what is COPD and what are your treatment options. The bottom line is that your respiratory health is too important to not get all the information you can about COPD. Here are some important questions to ask your doctors. Your healthcare provider will tell you that COPD is a broad term to describe a variety of progressive lung diseases, including chronic bronchitis, asthma and emphysema. As you’re already aware, COPD’s primary symptom is increasing breathlessness as your body is unable to properly process oxygen through your lungs. You’ll also learn that you may have had COPD for longer than you think because you may not have noticed earlier symptoms. When it comes to their respiratory health, many people associate breathlessness as a natural part of aging, which isn’t true. While your healthcare provider will tell you that smoking is the number one cause of COPD, he or she will also explain that there are other risk factors, as well. Those risks include genetic factors (AAT deficiency), working in high-risk industries that expose you to non-organic dust, such as mining and plastic manufacturing, as well as indoor pollution, such as second-hand smoke and radon. What happens if I quit smoking? When you stop smoking the level of carbon monoxide in your blood is cut in half within 12 hours. Your lungs will begin to repair themselves within a few weeks after you quit smoking. By your 10th year of non-smoking, your lung cancer risk will be cut in half. Will my medication have side effects? Ask your doctor about any side effects that may occur from taking COPD medication. One important concern you should have is whether treatment for your condition could potentially damage other, healthy parts of your body. What other changes can I make? Quitting smoking will have a significant effect on the progression of COPD. But diet and exercise can also have a positive impact on your respiratory health. Ask your doctor about exercise programs designed specifically for COPD sufferers. Will I need to be on oxygen? Your doctor will measure the amount of oxygen in your blood by using a pulse oximeter, or by drawing blood. The goal is to keep your oxygen saturation level above 88 percent. What stage am I in? COPD is divided into four stages: mild, moderate, severe and very severe. Your doctor will determine what stage you’re in by using a pulmonary function test called spirometry. It’s important to note that COPD affects everyone differently, and can be determined by a variety of factors – including whether you smoke, how much you exercise, and your diet. What shots or vaccines will I need? It’s recommended that everyone with COPD should get a pneumonia shot – generally every five years – because pneumonia can easily deteriorate lung health. Flu shots are also important because the flu also weakens your lungs. Choosing the right health provider is important in treating your overall respiratory health. Corpus Christi Rehabilitation Hospital is part of Ernest Health. Ernest Health provides specialized medical and rehabilitative services to our patients through our rehabilitation and long-term acute care hospitals. We treat patients who often are recovering from disabilities caused by injuries or illnesses, or from chronic or complex medical conditions. Our leadership team brings extensive healthcare experience to Corpus Christi Rehabilitation Hospital. We invite you to meet them and learn more about why they are passionate about healthcare. At Corpus Christi Rehabilitation Hospital, we are committed to being good neighbors and responsible corporate citizens in the Corpus Christi community.